1000 Follower Giveaway! | Back Home Again: 1000 Follower Giveaway! A few days ago, Marquis @ Simply Clarke and Kristyn @ Carolina Fireflies reached 1000 followers on their blogs! To celebrate reaching 1000 followers, they have teamed up with some of their favorite bloggers to throw a huge giveaway in order to say thank you to their readers. Take a few minutes and show each of them some love. 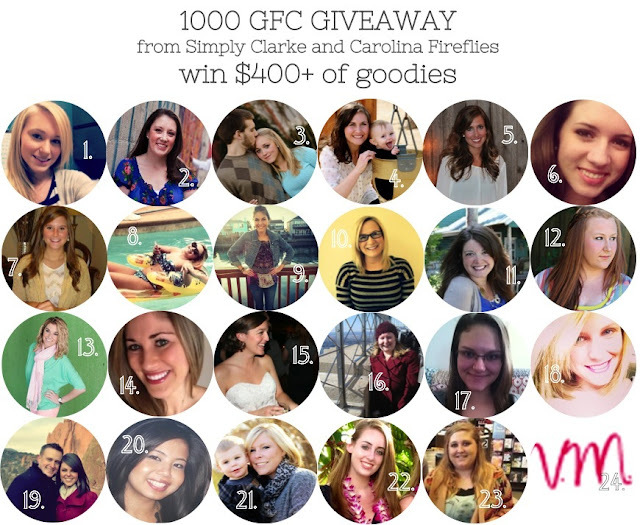 ONE lucky reader will win over $400 + of goodies from these 24 lovely bloggers! Check out each blogger below to see what they are giving away and show them some LOVE! 23. Simply Southern. Simply Lauren. - Choice of any shirt from my etsy shop.